My Vineyard hikes take me to many beautiful sites. I enjoy seeing the diversity of landscapes, many influenced by their agricultural past. A frequent plant I encounter in abandoned farm fields is northern bayberry (Myrica pensylvanica, now Morella pensylvanica). Quick to reclaim open pastureland, the shrubs have the unique ability to fix their own atmospheric nitrogen through specialized structures called root nodules. The nodules contain the nitrogen-fixing bacteria Frankia. This mutually beneficial symbiotic relationship allows bayberry to grow in soils with low fertility. Typical garden conditions produce a plant between eight and to 12 feet tall with an equal spread. In wild, windswept coastal grasslands plants may reach only a foot tall. In each case, plants spread underground with a strong tendency to colonize and expand their territory. The foliage of bayberry varies from dark to pale green, with a leathery tough exterior, and exudes a spicy fragrance when crushed. My own first encounter with bayberry were the Christmas candles my mother would light each year during the holiday season. The small gray-blue fruits (a hard stony drupe) contain a resinous waxy coating. The wax, called myracin, is the source of bayberry candles. Bayberry slowly loses its leaves as hard frosts and winds gradually remove the tough foliage as winter progresses. 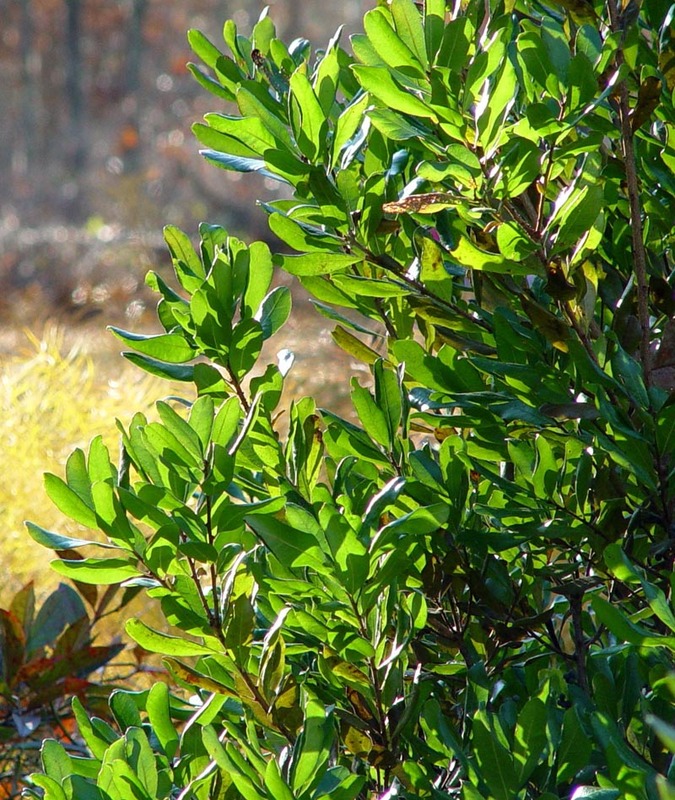 A shrub well-adapted to poor acid soils, bayberry has many uses as a garden plant. It can be planted on hillsides or embankments to stabilize soil and makes an effective screening or hedge. In urban areas, bayberry is often used in parking lots, roadside plantings and building entryways as it is very tolerant of de-icing salts, given its maritime heritage. In my home garden it hides the well head in our front garden bed. Sweet gale or bog myrtle (Myrica gale) is yet another species in the bayberry family (Myricaceae) that is found on the Island, growing primarily on wet sites, frequently at ponds or creek edges. Its blue-green leaves are not as rugged as northern bayberry, but they emit a pleasant fragrance when crushed. Sweet gale also has the capacity to fix nitrogen. It grows from two to four feet tall with a multi-stemmed habit. This plant has a tremendous natural distribution, appearing worldwide in northern latitudes. Rarely cultivated in modern landscapes, in Europe the foliage is used to sweeten beer (gale beer), also known as bog myrtle beer. A fragrant relative of both sweet gale and northern bayberry is yet another nitrogen-fixing shrub, sweet fern (Comptonia perigrina). Found throughout the Vineyard from roadsides, forest edge and coastal heathlands, it has a graceful appearance with soft fern-like foliage on a diminutive flat-topped shrub. In my own garden I employ it at the woodland edge underneath our birdfeeder. It spreads vigorously and creates a weed-free barrier that is both drought-tolerant and well adapted to sand acidic soils. It can tolerate both shade and full sun and its graceful foliage and habit are appreciated in the wild as well as the home garden. Tim Boland is executive director of the Polly Hill Arboretum in West Tisbury. This column appears on Tuesdays.